Unicorns We do not really believe in the existence of the unicorns. After careful analysis, we found out that many parts of the unicorn are fiction. The unicorn is said to come in different forms across the globe-how can one creature have so many forms? Furthermore, we suspect the unicorn ' horn - the alicorn to be pure nonsense. 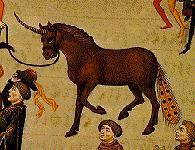 Many of the unicorn's facts are dubious and thus we conclude that the unicorn's existence is solely folktale. We later believed that the unicorn might be a silver-coloured deer seen by many people. That's how we deduce about the unicorn.